It's not a cake or a pie. It's not a pudding. It's a chocolate tart. 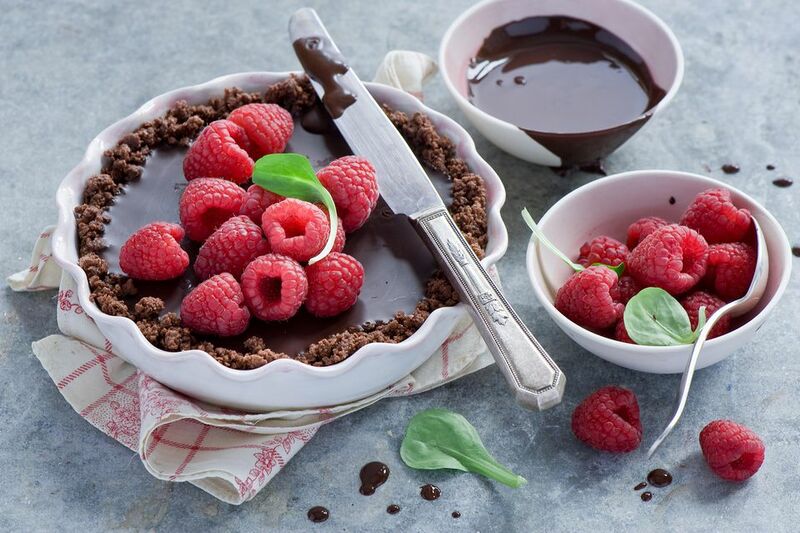 A deadly chocolate tart made with dark chocolate. I'm getting a buzz already just thinking about it. Early in the day begin making your tart. In a medium bowl, mix the chocolate cookie crumbs with the sugar. Drizzle in the melted butter. Mix all together and pour into a 9-inch tart pan with a removable bottom. Set the crust aside. Place the coarsely chopped dark chocolate into a large mixing bowl and set it aside. In a medium saucepan, whisk the heavy cream, milk and eggs until well combined. Heat just until the cream mixture until bubbles form around the edges and some steam is rising from the pot. Add the sugar and salt to the pot. Whisk until they are combined with the cream mixture. Remove the pot from the heat. Pour the cream mixture over the chocolate in the bowl. Cover the bowl with a piece of plastic wrap. Wait for about 5 minutes. One the chocolate is melted, stir all of the ingredients together. Carefully pour the filling into the crust into the tart crust. Place the chocolate tart into the refrigerator for at least 4 hours. Serve deadly chocolate tart with whipped cream. Store any remaining chocolate tart in the refrigerator. Crust * - you don’t have to make this tart with a chocolate crust. It can be made with a regular pie crust. Just be sure to prebake it. Prick the unbaked pie pastry with a fork. Place a piece of foil lightly over the crust. Add pie weights or dry beans to keep the pastry from puffing up. Bake it at 350 degrees for 30 minutes. The salted nuts make the chocolate flavor even stronger. This is not your traditional fudge recipe. Already salted peanuts and combined with sugar and chocolate to make this tasty fudge. Just those words: chocolate cake, and people pay attention. I know I could use a piece of chocolate cake right now. Don’t forget the yummy frosting that goes best with it. I’ve known about chess pies my entire life. I would have never thought about a chocolate chess pie. It’s wonderful, and yet incredibly easy to make. Smooth and creamy is the best way to describe this ice cream. It’s made with either chocolate syrup or Dutch processed cocoa. Loads of chocolate and peanuts cooked in the crockpot and then scooped out to make these chocolate peanut clusters.